Additionally, both, the general and electrical contractor licenses have sub-types among which you need to choose when applying. All of these types of licenses have fairly similar application requirements. For all of these, you will need to have a business registration in the state, pass a qualifying examination, as well as provide a North Carolina contractors license bond. 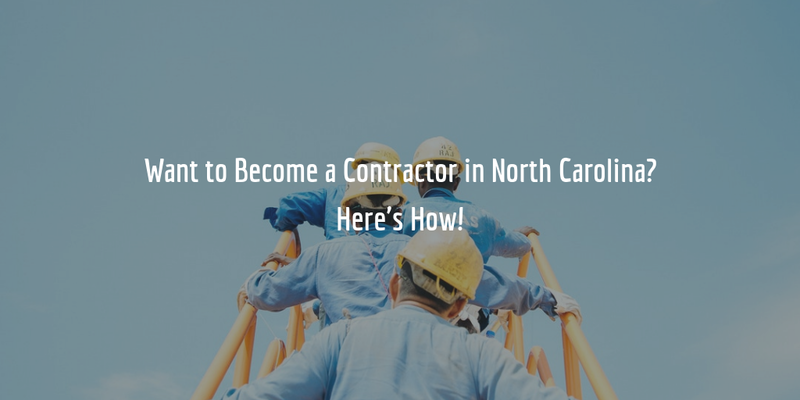 Here’s what you need to know about how to get your NC contractors license! General contractor license – this license has six different classifications that applicants can choose from and four different types of limitations that determine the scope of work which can be performed. Read the full General Contractor License Guide for North Carolina. Electrical contractor license – there are 10 different classifications that are available to applicants for such a license, depending on the type of work you wish to perform. Read the complete Electrical Contractor License Guide for North Carolina. Landscape contractor license – this license has no additional classifications and is required to perform landscaping work over a certain dollar amount. Read the complete Landscape Contractor License Guide. HVAC license – this type of license has a couple of classifications, depending on the type of buildings that you want to work on and your specialties. Check out the full HVAC License Guide for more information. For a detailed guide on how to get any of these licenses, follow the links above! While the licensing process for the different contractor types differs slightly, most steps for all four major license types overlap. Here are the most common licensing requirements for NC contractors. You will need to get a business registration at the Office of the Secretary of State. This process will differ depending on whether you are a sole proprietor or will be registering a corporation. You will need to complete your license application form and submit it to the relevant Licensing Board. For general contractor license, you need to apply at the Licensing Board for General Contractors (NCLBGC). Applicants for an electrical contractor license need to apply at the State Board of Examiners of Electrical Contractors (NCBEEC), and landscape contractor license applicants apply at the Landscape Contractors’ Licensing Board (NCLCLB). Where applicable, the application will require you to specify the classification you are applying for. It will also frequently feature questions about your professional background. In some instances, you may be required to attach a recent financial statement and balance sheet. You may also need to attach several personal and professional references. Some types of general contractors, as well as landscape contractors, require a contractor license surety bond as part of their application process. Electrical contractors initially only require a statement of bonding ability by their surety. Later on, when they begin working on projects, they are required to obtain bonds in certain amounts, as determined by their license classification. All applicants for a contractor license are required to pass some form of examination in order to be approved for their license. The exam will test your degree of knowledge for the license type which you wish to obtain. For electrical contractors, this step comes before submitting their application form. General and landscape contractors must first submit their application and are then approved for an exam. Depending on your license type you may be required to pay a fee when submitting your application or a fee when getting approved for a license, or both. These fees vary between $60 and $180. All of these licenses are renewed yearly. Electrical and landscape contractors, in particular, must pass continuing education courses in order to be able to renew their licenses. Applicants for a contractors license in North Carolina frequently require a surety bond. Regardless of the license type, these bonds are required for similar reasons. License bonds guarantee that licensees comply with state laws that regulate how they conduct business. In North Carolina, various chapters of the North Carolina Administrative Code (NCAC) specify the responsibilities and obligations of contractors. For landscape contractors, in particular, the Landscape Contractor Licensing Statutes specify the rules and regulations they need to follow. The surety bond also guarantees that if a contractor should violate the provisions of the law and thereby cause losses or damages to the state or the public, a claim can be made against their bond. Such a claim serves to secure compensation for claimants up to the full amount of the contractor’s surety bond. Do you need a surety bond for your license? Complete our bond form, and we will provide you with a free quote on your bond! If you have any further questions about the bonding requirements for contractors in NC, call us at 866.450.3412 anytime!